Radical Egyptian cleric Yusuf Qaradawi is considered so radical that the United States banshim from entering the country. Qaradawi, considered the spiritual leader of the Muslim Brotherhood movement, has called for the killing of Jews andAmericans. That history makes the June 13 White House meeting with Sheik Abdullah Bin Bayyah all the more inexplicable. Bin Bayyah is vice president of the International Union of Muslim Scholars (IUMS), a group founded by and headed by Qaradawi. The IUMS has a long history of supporting Hamas –a top Hamas leader is an IUMS member – and of calling for Israel's destruction. Bin Bayyah's June 13 account placed other senior officials in the meeting, including:Rashad Hussain, the U.S. special envoy to the Organization of Islamic Cooperation (OIC), National Security Adviser Tom Donilon and White House spokeswomanJennifer Palmieri. But the account was later changed to delete the reference to Donilon's presence at the meeting. 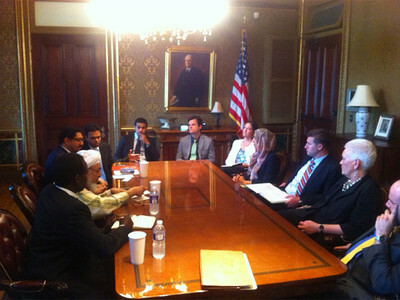 Sheikh Abdullah Bin Bayyah posted this photo of his June 13 White House meeting. Bin Bayyah lobbied the White House to "take urgent action" to help Syrian rebels. "We demand Washington take a greater role in [Syria]," Bin Bayyah told Al-Jazeera. President Obama laterannounced plansto arm Syrian rebels. A 2004 fatwa, issued while Bin Bayyah was an IUMS board member, sanctioned "resistance," meaning attacks on American troops in Iraq as a duty on every able Muslim in and outside Iraq." Jamal Badawi, a longtime ISNA board member, also is listed as a member of the IUMS Board of Trustees. Badawi has repeatedly defended Palestinian terrorismincluding suicide bombings. His name appears on the first page of a 1992 telephone directory of Muslim Brotherhood members in the United States, and he is listed as a fundraiser in records from the 2008 Holy Land Foundation Hamas financing trial. After a board of trustees meeting in December, the IUMS issued a communiquecalling on Hamas and Fatah to reconcile in the name of "the core Palestinian values (including the right of return and resistance until the liberation of Palestine and its capital Jerusalem) … Meanwhile, the union calls on the scholars of the nation to continue their religious role in enlightening the local and international public concerning the dangers that this Judaization policy in Jerusalem poses for the historic unity of the Palestinian territories which is religiously impermissible to give up one inch of it." In 2009, it issued a fatwa forbidding any normalization of relations with Israel. It came on the 42ndanniversary of the Six-Day War, and Israel's capturing of the Temple Mount. "America and Israel are pleased with [the Egyptian opposition] movements, which are led by the brainless," Kholif said during an appearance on Egypt's Al-Hafez televisionflagged by the Middle East Media Research Institute (MEMRI). "They have said so in The Protocols. Let me tell you exactly what they said in The Protocols: 'We will strive to undermine security in the lands of the Gentiles, through reckless revolutions, led by the brainless.' It says so in The Protocols of the Elders of Zion, as translated by Khalifa Al-Tunisi. 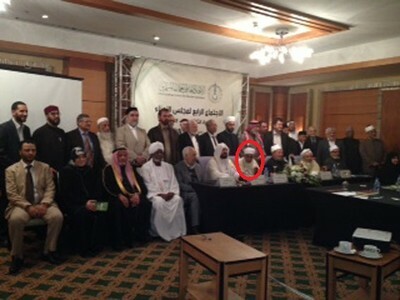 In addition to his role as IUMS vice president , Bin Bayyah also is a member of the similarly anti-Semitic Qaradawi-founded European Council for Fatwa and Researchand the OIC's International Islamic Fiqh Academy, the latter of which issued a resolution in January 2003 sanctioning Palestinian suicide bombings. Qaradawi and Bin Bayyah show a keen mutual admiration of each other in their writing. Bin Bayyah notably referred to Qaradawi as "a mountain upon whose peak there is light" and as "a great reformer" who "spreads knowledge and wisdom" in a 2008 article published by Boston cleric Suhaib Webb. Qaradawi returned the favor three days later: "The reality is that the more I have come closer to him and got to know him better, the more I have loved him…"